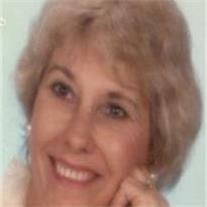 Marchant, Jacqueline S (Jackie) of Mesa, passed away on 12/27/2009. Jackie was born in Bethany, Missouri and was raised in Basin Wyoming. Jackie was the loving mother of four boys; Jay, Bret, Rich and Paul Marchant. Jackie is also survived by her devoted husband of 53 years, John (Jack) Marchant. She has 8 grandchildren and 6 great-grandchildren. She was a retired insurance executive with Sentry Ins. and was active in the LDS Church, community organizations and she was a member of the Daughters of the American Revolution. Jackie was; a Silver Beehive Recipient in Scouting, President of the Insurance Women’s Association of Arizona, and Insurance Woman of the Year. After retiring, she then volunteered with New Frontiers Education and more callings in her church. Jackie will be missed by her many close friends and family as she was special to all that her life touched. Services will be held on 12/31/09 at 11 a.m., at the Church of Jesus Christ of Latter-day Saints, Alta Mesa Stake Center, 5350 E McLellan Rd, Mesa. Visitation 10 a.m.